Jesse Connelly’s friend with benefits bolted after Jesse disclosed his HIV status. Stood up and stinging, Jesse tries to drown his sorrows... and finds an unexpected connection with a lonely bartender. But as Garrett’s feelings for Jesse deepen, so does his grief for the man he lost — especially as he sees hints of his late husband in his new boyfriend. Now Garrett has to figure out if Jesse is his second chance at true love, or if Jesse’s just filling in for the man he’s never fully grieved. And he needs to figure it out soon, because Jesse’s starting to wonder the same thing. The Bluewater Bay stories can be enjoyed in any order — jump in wherever you'd like! I decided to read New Hand for the very reason I probably shouldn’t have – Jesse’s HIV status. You see, my best friend and partner of nearly a decade was HIV+, and while we weren’t romantically involved, I saw the struggles he dealt with when disclosing his status to others. So I already had a vested interest in Jesse before opening the book and knew this was going to be a particularly personal read for me. However, I had no idea just how hard it was going to hit me until Garrett revealed why his husband died. I actually considered stopping the book right there because I wasn’t sure I could deal with the emotions I knew would come up as I read their story. But I’d just finished reading a romantic comedy the night before and my spirits were still buoyed by it, so I stuck with New Hand and I’m so glad I did – even if I lost track of the number of times I cried while reading it. Don’t let my emotional reaction to the book scare you off because it’s really not a sad story, it’s just a difficult time of year for me to read a story that hits on two of my biggest issues. In fact, Jesse and Garrett’s meet cute was perfect – the “they don’t make ‘em much gayer than me” guy who’s just been stood up spends the night chatting up the hot bartender at a lumberjack bar and both men part for the evening feeling grateful to have made a real connection with someone, if only for that night. For Jesse, it was a balm to his soul after being rejected by someone he’d considered a friend. For Garrett, it was an indication that maybe he wasn’t as dead inside as he’d thought he was since his husband’s death less than a year ago. Because both men have baggage they’re unsure of how to share, their journey is not smooth sailing – but it is realistic, even as moments of it left me crying for one, the other, or the both of them. And again, I feel like I’m focusing on the depressing parts, but this was an emotional read for me. That said, I loved watching these two geek out over games and things I have no clue about, but it didn’t matter because their shared passion for them was obvious. Their relationship developed slowly in some respects and moved quickly in others, and yet it felt right for them. There was no rush to bed and that allowed them to savor their time getting to know one another and start building the foundation they would need when obstacles tried to derail them – and boy, were there some doozies. It’s my understanding that this is the final installment in the Bluewater Bay series and I loved how Witt addressed the show that got it all started, Wolf’s Landing. That the author was able to incorporate several of the past characters and include yet another wedding for a couple from a previous book reminded me why I enjoy this series so much. The people of Bluewater Bay and Wolf’s Landing have forged lasting bonds, meaningful relationships, and families – both legal and emotional – over the course of the series. The sense of community and camaraderie that has developed over the past three years has made these characters feel more like friends than fiction, but at least I can revisit Bluewater Bay anytime I want. Garrett is mourning the loss of his husband. He is wrapped in the pain of surviving, watching someone he loves die, and having to deal with the aftermath. He choses to pick up and start over near friends – away from the pain of his husband's death. He has found a happy place and despite not having the accounting job anymore, he loves being a bartender. Jesse is living life the best he knows how. Being HIV positive is sometimes a hinderance on his personal life, but he's had it so long that he knows how to handle it. When he finds himself stood up by someone he thought cared for him, he finds himself at the mercy of Garrett. This story is more than a romance. It is both men working through their own preconceived notions, prejudice of society, and their own family drama. Their relationship begins rocky and kind of stays on that precipice for a while. I wish that there was less introspection and more relationship, but overall this was a successful story. Both characters grow throughout the story and, for the most part, they find themselves and each other. This is the last Bluewater Bay book and I really wanted to love it. But this is a heavy, difficult read and somewhere between the grief, the angst, and the miscommunications, my attention wandered. I loved Jesse in the previous book and I enjoyed him here. His back story and his struggles as an HIV positive man are difficult, but I loved the fun he has with his work and the relationships he has with his geeky friends. I’m still not sure Garrett was ready for a new relationship when he met Jesse. His grief overwhelms the story at times. His struggles are awful. His pain is real. But this is supposed to be a romance and I want to know that the men in my romances are meant for each other. That they make each other better people. And I didn’t feel that here. At times, I just saw Jesse getting a raw deal because Garrett was still grieving hard. There are some lovely moments here. I loved seeing favourite characters from earlier books and watching them come together in this one. I loved Lydia, Simo,n and Ian fiercely in the previous story and I’m glad they’re all back in this one. I’ve really enjoyed this series, but unfortunately, Garrett and Jesse didn’t quite work for me. 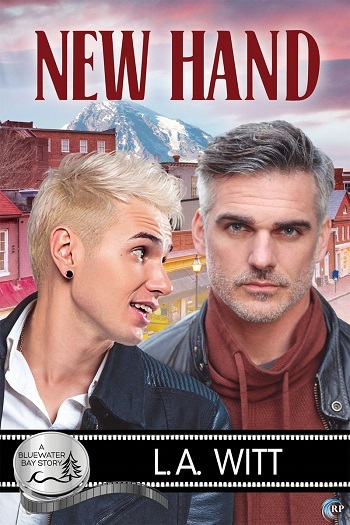 Reviewers on the Wicked Reads Review Team were provided a free copy of New Hand (Bluewater Bay #23) by L.A. Witt to read and review.